July 26, 2011.- The hourly average price of electricity in the daily market for the first half of 2011 has been 46.68 €/MWh, that is, 6.8% higher than the previous semester and 55% higher than the first half of 2010. The minimum hourly price in this semester has been 0 €/MWh for 12 hours, which were all registered in January. The maximum hourly price was also recorded in January – on the ninth between 21:00 and 22:00 – reaching 91.01 €/MWh. 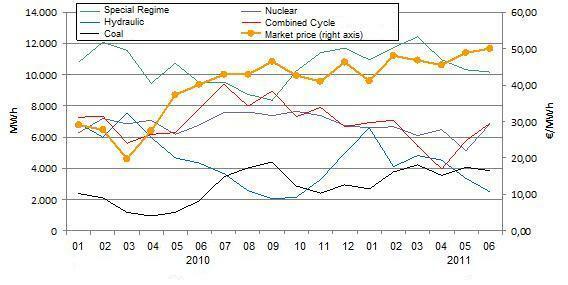 The price increase of electricity in the wholesale market has been influenced by several factors. Amongst them are the drop in hydraulic production, the price increase of fuels, the stagnation of installed wind power and the downturn of production in combined cycle plants – registering a historical minimum utilisation factor. Following the historical maximum values of hydraulic production registered in 2010, which caused the price to drop in January of 2010, hydroelectric plants are producing around 25% less electricity in 2011. This has kept the price on the same level. The geopolitical conflicts that took place in North Africa during the early part of this year and that influenced some of the main gas and oil-producing countries are other contributing factors of this price increase experienced in the first half of 2011. 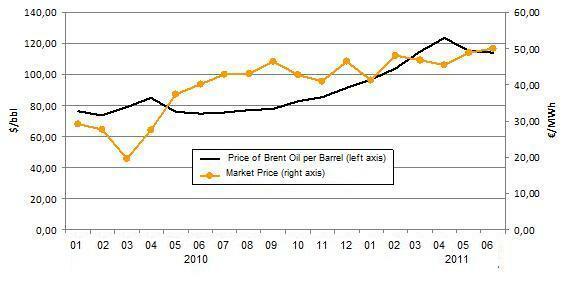 These conflicts caused restrictions in the supply of gas and oil, whose prices increased in international markets. According to the National Energy Commission, not one MW of wind power has been installed in Spain during the first half of 2011. According to the REE (Red Eléctrica de España, S.A.), the power installed was 145 MW. In any case, after having installed an average amount of 2,000 MW per year since 2007, this information clearly shows stagnation in installed wind power. Due to wind power being a non-controllable energy source and paid by means of bonuses, wind production tends to lower the price of electricity in the market. 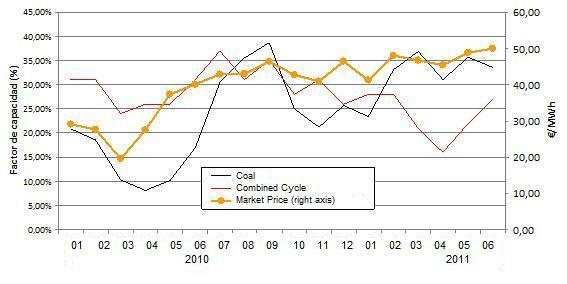 Since the coal decree came into effect, the capacity factor of coal-based thermal plants has increased. This has influenced the use of combined cycle units in a negative way, which have also been affected by the price increase of natural gas due to the political instability present in the producing countries. The coming into effect of the coal decree in February, which regulates national production and determines the minimum consumption of national coal for plants part of the restrictions procedure of guarantee of electricity supply, has also had other effects on the price of electricity in the wholesale market. Fixing the compensation for the energy produced by these thermal plants has resulted in a tendency of the market price to align with the price set by the plants assigned with higher production. In fact, the production of electricity using coal set the marginal market price on 41% of the hours in July, overtaking hydraulic generation – which had registered the most hours up to that moment. This reduced the price difference between peak hours and off-peak hours and negatively affected hydraulic generation, as it takes advantage of off-peak hours to purchase electricity and subsequently sell it for the top prices at peak hours. Hydraulic generation has reached minimum historical values in the first half of this year. The result of the CESUR auction for the third quarter of 2011, which sets the price at which the electricity is purchased for consumers of the last resort tariff, was 53.20 €/MWh for the base-load product. 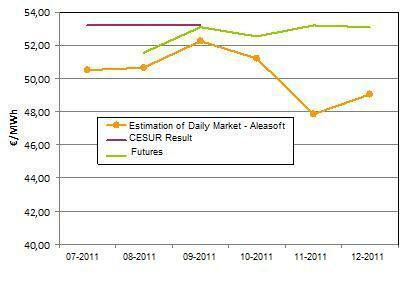 The products in the futures market to be closed in the second half of this year show prices above 52 €/MWh. Aleasoft’s estimates for the daily market price of electricity indicate that the monthly averages will be between 48 and 52 €/MWh. 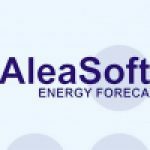 AleaSoft was set up in 1999 as a result of the deregulation of energy markets in Europe and develops its own technology for developing forecasting models for energy markets, which it uses to forecast demand and prices. AleaSoft solutions meet the market’s needs in terms of accuracy and automation, and are used by players on European energy markets including Endesa, Iberdrola, Gas Natural Fenosa, E.ON España, E.ON Italia, BP, Shell, Electrabel Suez group, Enel, EDF and Slovenskè Elektrárne in the Enel group. AleaSoft solutions are also used by operators of national electrical systems, including, Statnett (Norway), REE (Spain), Terna (Italy) and FEDA (Andorra). Companies and investors, essentially in the renewable energy sector, commission reports with customised forecasts to aid in taking decisions concerning investments and divestments.